Community Forklift – Information about how to donate to the Forklift. 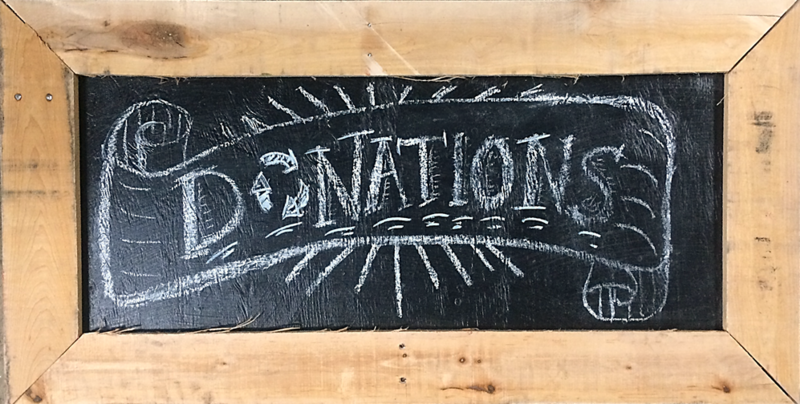 Your donations help us lift up local communities, reduce waste, create good green jobs, educate the public about reuse, and provide free materials to nonprofits and neighbors in need! ReuseWood.org – This directory lists reuse stores, companies, and nonprofits that deal in reclaimed lumber, architectural salvage, reuse, deconstruction and related services throughout North America (Hosted by the Building Materials Reuse Association, the American Wood Council, and the Canadian Wood Council). Habitat for Humanity ReStore resale outlet directory – A nationwide directory of reuse stores run by Habitat for Humanity. The Builders Recycling Guide – A directory of options for recycling or donating construction and demolition materials in the Washington, DC area. It’s a very useful resource, especially for contractors & property managers. Earth911.com – Earth 911 maintains a nationwide recycling and donation directory – just enter your zip code and the type of item you want to donate. Their website also has great reuse tips and DIY ideas. Craigslist Free Section – Post a free classified ad to offer an item to anyone in your local region. MdRecycles.org – A directory of recycling, donation, and reuse options available in Maryland. Northern Virginia Reuse Directory – A directory of charities that accept donations in Northern Virginia. SCRAP B-More – (410) 637-8333: SCRAP is a donation-based creative reuse store and donation center that has ever-changing and diverse items for creative projects. Their mission is to inspire creative reuse and environmentally sustainable behavior by providing educational programs and affordable materials to the community. Silver Spring Creative Reuse – (202) 549-2090: This organization accepts fabric, art supplies, office supplies and any other material that can be used creatively. Email silverspringcreativereuse(at)gmail(dot)com to schedule a pick-up/drop off. UpCycle Creative ReUse Center – (703) 861-8705: A reuse center and studio located in Alexandria, VA that collects a wide variety of supplies that can be used creatively, including paper, fabric, containers, jewelry, office and artist supplies, and more. At UpCycle, they rethink the notion of waste, collecting cast-offs from the community to serve as creative art materials. UpCycle CRC collects, organizes, and preps items for use in a variety of creative capacities. Bikes for the World – (703) 740-7856: The nation’s largest “recycler” of used bicycles and related items is located in Rockville. Supported by more than 100 DC-area institutional partners and hundreds of individual volunteers, Bikes for the World serves as a clearinghouse putting this diverse material to highest and best use, locally and around the globe, distributing more than 11,000 bicycles annually. They also collect good-quality metal portable sewing machines in working order, or close to it. Older Singer and similar machines are high-value, in-demand items that fit in small spaces in the shipping containers without displacing bikes. Like bicycles, sewing machines represent a “productive asset” for a low-income working person, and are often distributed to the same vocational programs as their bikes. A Wider Circle – (301) 608-3504: This Silver Spring nonprofit redistributes furniture and home goods to individuals and families transitioning out of battered womens’ or homeless family shelters or to those simply living without life’s necessities. In order to restore dignity into the lives of their clients, they ask that all furniture items are in good condition, with no rips or stains. Due to recent recalls, they are unable to accept drop-side cribs. ACCA – (703) 256-9513: The Annandale Christian Community for Action works with volunteers to collect, store, and deliver donated furniture, free of charge, to needy families in the Annandale, Bailey’s Crossroads, and Culmore areas. Goodwill – (202) 636-4225: Goodwill of Greater Washington’s mission is to transform lives and communities through the power of education and employment. We accept gently used clothing, furniture, housewares, working electronics and many other items. These items are then resold through our chain of thrift stores and the revenues help fund our employment, free job training and placement services for people with disabilities and disadvantages. Mission of Love – (301) 333-4440: The Mission of Love Charities of Capitol Heights, Maryland, is a multifaceted nonprofit health and human services organization dedicated to helping the underserved by providing free programs and services designed to meet their immediate and short-term needs. While we continue to accept clothing, household amenities, we are constantly in need of good usable furniture as well as other household items that could be used to get a family off to a good start as they find housing. At the moment, we don’t know anyone in the region who handles office furniture. If you know about a place that accepts office furniture for reuse or recycling, please let us know! Leveling the Playing Field – (301)844-5620: This Silver Spring nonprofit works to give underprivileged children the opportunity to participate in youth sports through the donation of used sporting equipment. In order to continue putting sporting equipment in the hands of those who are less fortunate, we rely heavily on individual donors. Take this as an opportunity to clean out your garage and yard so that you can donate excess sporting equipment to our cause- let your old gear give kids the opportunity to reap the mental and physical benefits of recreation. All Eco Design Center – All Eco Design Center is an all new design showroom dedicated to everything eco-friendly. Flooring, countertops, kitchen and bath accessories, LED lighting, solar & more. From high-efficiency dual flush toilets to tiles made from recycled tires, it’s here. Amicus Green Building – The Amicus Green Building Center is a one-stop source of genuine green products, resources, and expert support to help you create a healthy, environmentally friendly, stylish, energy smart and sustainable building. The Center is open to the public. Architects, designers, building professionals, and the general public are welcome. Anacostia Watershed Society – The Anacostia Watershed Society (AWS) is a local, 501(c)3 non-profit environmental organization that is working to protect and restore the Anacostia River and its watershed. AWS seeks to fulfill its mandate of a swimmable and fishable river through its programs of education, action, and advocacy. Arlingtonians for a Cleaner Environment – This organization is very active, with great resources on their website and newsletter, as well as frequent educational events that are useful for folks in and around Arlington and Northern VA. The Brass Knob – The Brass Knob specializes in architectural antiques and salvage for restorations and renovations, as well as new construction. Ideal for both commercial and residential projects, The Brass Knob stocks authentic antique hardware, restored lighting, mantels, stained glass, and a variety of decorative items in its nearly 3,000-square-foot retail space. Our one-of-a-kind items range in period, scale and price for all budgets, tastes, and projects; our inventory is constantly replenished with new finds, many of which come directly from the Washington DC area. Building Materials Reuse Association – The BMRA is a non-profit educational organization whose mission is to facilitate building deconstruction and the reuse/recycling of recovered building materials. They have a useful national directory of reuse stores similar to Community Forklift searchable by state. A Guide to Community Solar – If your home isn’t suited for solar panels, or you are looking for a green investment, you should consider joining in a community solar project. Our friends at nearby University Park Community Solar contributed to this useful guide. Eco City Farms – ECO City Farms grows great food, farms and farmers! They are a local urban farm and educational center for sustainable urban agriculture. Because their Edmonston farm is just around the corner from Community Forklift, we frequently hold joint workshops about sustainability. Green America – This fantastic organization helps you make sustainable choices in your personal life, and join with others in economic action to work for a better world. They provide information about going green, Fair Trade products, the social and environmental rankings of large companies, avoiding sweatshop and child labor products, socially-responsible investing, and more. Search their National Green Pages directory (http://www.greenpages.org/) to find green products and services from thousands of businesses committed to social and environmental responsibility. The Green Building Institute in Jessup, MD – The Green Building Institute, a 501(c)3 nonprofit organization serving Northern VA, DC, and MD, educates the public and building and design professionals about sustainable building practices and technologies. They offer programs on various elements of green building, including rainwater collection, energy efficiency, and solar energy. Environmental Working Group’s Skin Deep Cosmetics Database – Use this website to find green, safer, earth-friendly and organic alternatives for the products you need to take care of your family, home and garden. Just click on a category and view the facts on everything from makeup to baby food to pesticides. Green Industry Resource – Green Industry Resource is simply an organized online database of eco-friendly building goods, services and information. Green Mortgages – Energy Efficient Mortgage Guide – Green, or “Energy efficient” mortgages, let you borrow extra money to pay for energy efficient upgrades to your current home or a new or old home that you plan to buy. The result is a more environmentally friendly living space that uses fewer resources for heating and cooling and has dramatically lower utility costs. The types of things that are covered include upgrades that you may have thought you couldn’t afford like double-paned windows, tankless water heaters, modern HVAC systems, and new insulation. Mt Rainier Bike Co-op – MRBC is a community, volunteer-run bike shop where you can learn to work on your own bicycle! Throughout the year, we offer bike mechanics classes, an earn-a-bike program, and open shop hours for ages 6-adult. Mt Rainier Tool Shed – The Mount Rainier Community Tool Shed is a collection of hand and power tools that can be used at no cost by residents, businesses, and community groups of Mount Rainier, Maryland, to help improve their property. With initial funding provided by the Prince George’s County Livable Communities Initiative, the Tool Shed’s purpose is to increase the beauty of Mount Rainier through home repairs, yard improvements, and care of public spaces. National Building Museum – The National Building Museum is located in DC, and dedicated to exploring and celebrating architecture, design, engineering, construction, and urban planning. They often have workshops, exhibitions, and events dedicated to sustainable design and green building. Port Towns Community Development Corporation – The Port Towns CDC is working for economic development in Bladensburg, Colmar Manor, Cottage City, and Edmonston, Maryland. Prince George’s Green – This organization seeks to be a catalyst for the green economy in Prince George’s County, with a focus on green workforce development and green business development. If you are a business in Prince George’s County, contact them to find out how you can become a Certified Green Business! Solar Energy Guide – Information from ConsumerAffairs.com about the types of solar energy companies out there, including the different features offered. Sustainable Energy Rebates, Incentives, and Info for Prince George’s County – Information for county residents, as well as general information and Maryland state resources. Sustainable Energy Incentives and Info for Washington DC – Information for residents and businesses in the District. US Green Building Council – The US Green Building Council is a national organization that focuses on providing green building resources, education and leadership around the country. The local affiliate provides classes to help keep green builders competitive in the overall market as well as staying educated on the most recent green developments. Local historic preservation professionals (from the Prince George’s County Historic Preservation Commission). PreserveList is a directory of contractors in the mid-Atlantic region with a focus on preservation and historic resources. Where to check if your contractor or tradesperson is licensed – before you sign a contract!